"The Plea is one of the most purely entertaining books you'll read this year. It's a blast." Billionaire David Child swears he didn't murder his girlfriend, Clara. But the evidence overwhelmingly shows that David killed her: the security video showed no one else entering their apartment, the murder weapon was in his car, and he was covered in gunshot residue he can't explain. The FBI believes David's arrest and obvious guilt could help them take down a huge money laundering scheme--if they can get him to testify. Con-artist-turned-lawyer Eddie Flynn is given the job: persuade David to plead guilty and give the agents the evidence they need. If Eddie can't get David to take a plea bargain, the FBI has incriminating files on Eddie's wife--and will send her to jail. But David insists that he didn't murder anyone. "Nasty, vicious, ruthless. That's the way we like our legal mysteries, so The Plea fits the bill...The impressive legal maneuvering pays off in a centerpiece courtroom drama." "Rip-roaring legal thriller...Twisty, bloody, and convincing." "Fast-moving, low-punching, street-hustling adventure... Seriously superior airport read." 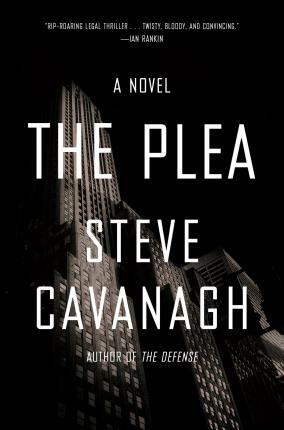 "If you're a fan of John Grisham, Scott Turow, and Brad Meltzer, then you will be a fan of Steve Cavanagh's The Defense." "This guy is the real deal. Trust me." "Steve Cavanagh pulls off an enviable premise with panache." "Expertly combines his authority on the law with an absolutely great thrill ride." "Steve Cavanagh is the John Grisham for a new generation." "Smart and original. This is a belter of a book."